This recipe for beef chili meal prep is one of my favorites! 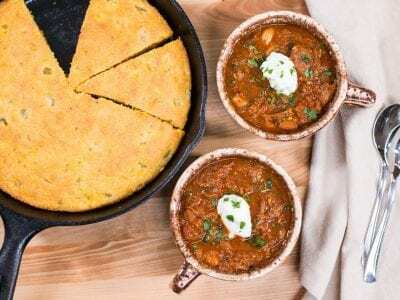 Chunky beef chili recipe with skillet cornbread. 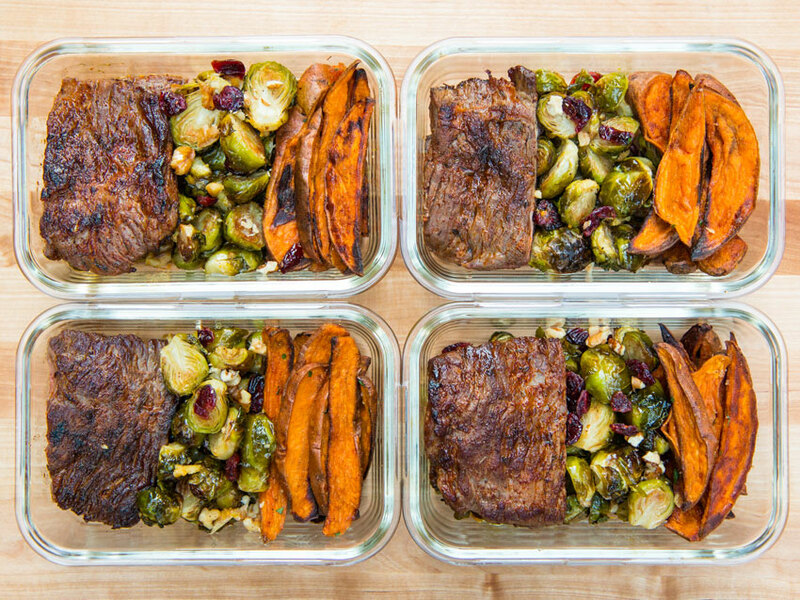 This recipe is great for beef meal prep. Cook’s Notes: You can buy beef chuck that is cubed at the meat counter of your grocery store. If they don’t have it, ask the butcher to cut a 1.5 pound piece of beef check into cubes for making chili. You can find dried ancho and chipotle peppers at most markets, but you can also use any dried pepper you want for this recipe, just make sure it’s not too spicy. If using dried beans, soak and cook them ahead of time. Regular cornmeal is too fine for this recipe, I like the cornbread to have a little texture, so look for medium grind cornmeal or medium grand polenta. For the chili, soak the ancho chiles in very hot water for at least 10 minutes, then transfer to a blender with 1 cup of the soaking liquid and add the next 6 ingredients. Blend well and set aside. Save any leftover soaking liquid for later. Pre-heat the broiler to high and peel the outer paper off the tomatillos and place them on a sheet tray with the poblano pepper. Broil for about 10 minutes or until evenly charred on all sides, making sure to turn the poblano and tomatillos. Once the pepper has cooled down, run some cold water over it and remove all the seeds and try to peel away most of the charred skin. Add the poblano and tomatillos to the blender with the chile mixture and blend until smooth. Pre-heat a large stock pot or dutch oven over medium heat along with 2 teaspoons of oil. Add the onions and bacon along with a ½ teaspoon of salt ad few cracks of pepper. Cook for 10-12 minutes or until the bacon has rendered a good amount of fat and the onions are soft and translucent. Use a spoon and transfer onions and bacon to a bowl. Raise the heat to just below high and add 2 teaspoons of oil. Season the brisket with a generous amount of salt and pepper, and cook until brown on all sides, about 7-10 minutes. Turn the heat down to medium. Add the bacon, onion, and blended chile mixture to the pot along with the canned tomatoes, beans, and a ½ teaspoon of salt. Add the leftover chile soaking water and enough water to cover everything by 3 inches and bring the chili to a simmer. Place a lid on the pot and cook for 2 hours, stirring a few times. 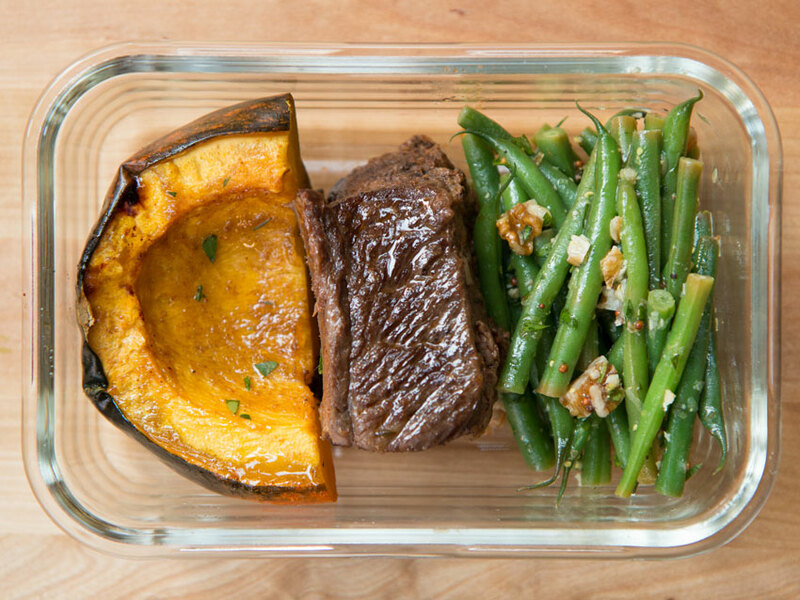 After 30 minutes, check for seasoning, you will most likely need ½ teaspoon of salt. If the chili gets too thick, just add more water. After 2 hours, take the lid off and add 1 tablespoon of honey, stir well and check for seasoning. It may need more salt or if the flavor is too acidic, add more honey. Use a large spoon or spatula to mash to beef cubes into small pieces, this will help make the chili thicker. Remove the heat from the chili and set aside. Chili will get better the next day! If using a slow cooker, first cook the onions and bacon in a cast iron pan, then use then same pan to brown the beef. 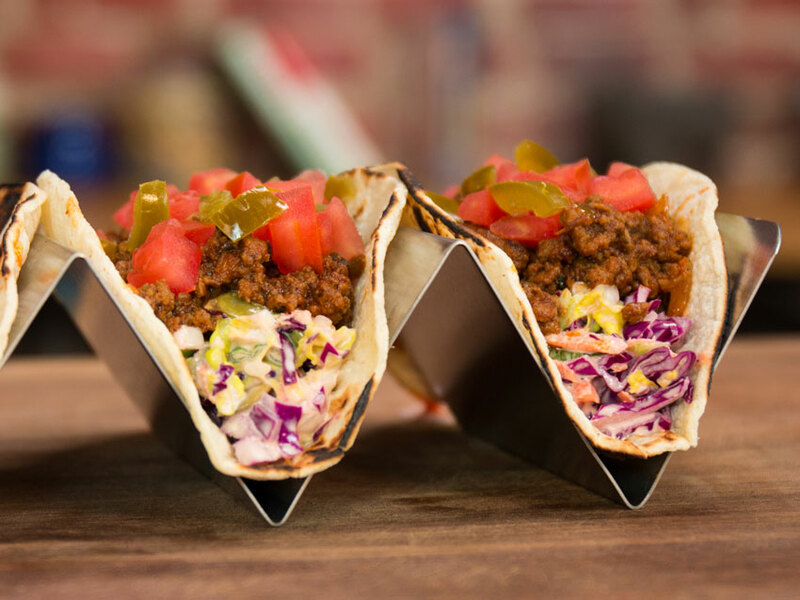 Follow the rest of the instructions and cook for 6-8 hours in your slow cooker. For the cornbread, Toss a 10-12 inch cast iron pan in the oven and pre-heat at 375 degrees F. For the dry team, add the first 6 ingredients to a large bowl, mix well and set aside. For the wet team, add the almond milk and lemon juice to a large bowl along with the eggs, whisk well. Add 7 tablespoons of melted coconut oil, mix well. If the almond milk is cold, the coconut oil may harden slightly, but don’t worry about it. Pour the wet team on to the dry team and mix well using a spatula. Add the corn and green chiles, mix well until everything is well combined. Let the batter sit for 5 minutes so the cornmeal can soften a bit. Using an oven mitt, grab the cast iron pan from the oven and add the remaining tablespoon of coconut oil and spread well. Add all the batter and bake for 30-35 minutes, or until golden brown and a toothpick inserted into the middle comes out clean. Let rest for at least 10 minutes and enjoy! The chili will keep in the fridge for 5 days and so will the cornbread. 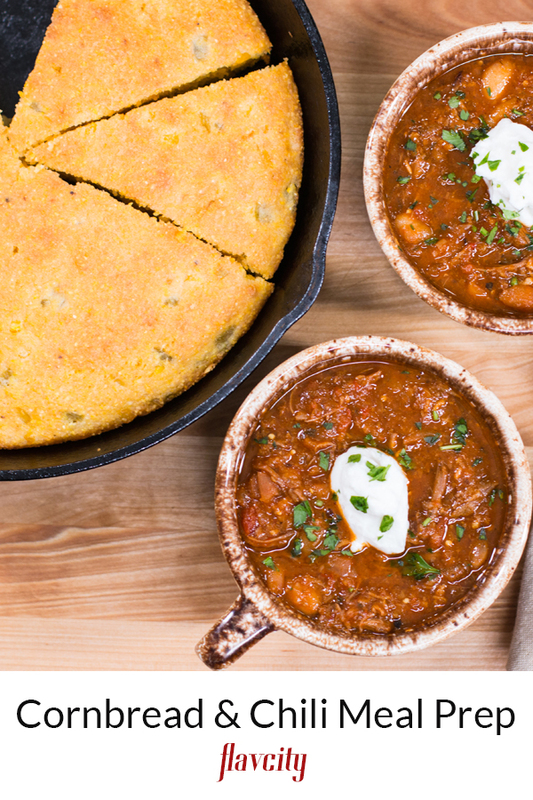 You can also freeze the chili and cornbread for 2-3 months. My favorite way to reheat the chili is in a pot over medium heat, If using the microwave, cover the chili with a wet paper towel, and reheat making sure not to heat too long or too hot, or the beef will dry out. I like to reheat the cornbread in a toaster oven or just eat at room temperature. 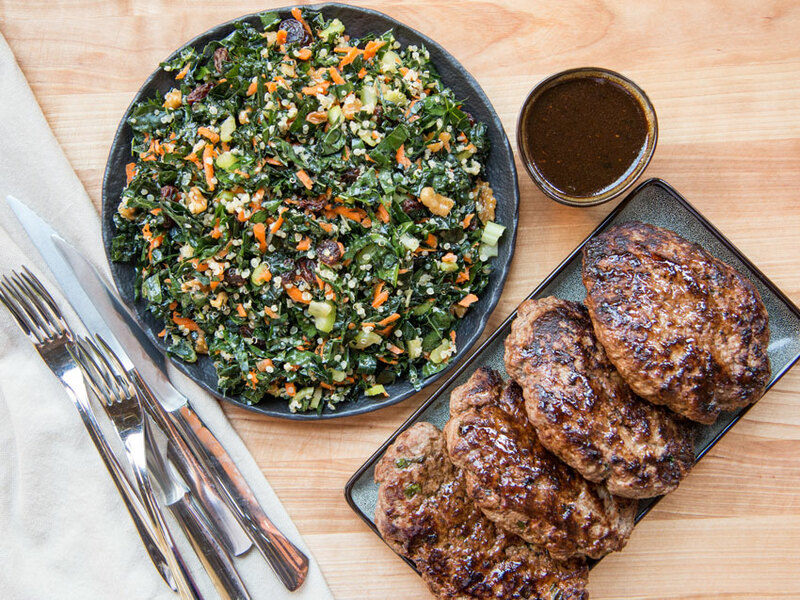 I was wondering if this recipe could be done using ground beef instead of chuck roast and if so how would I alter the recipe to use this type of beef? I would not recommend substituting ground beef. 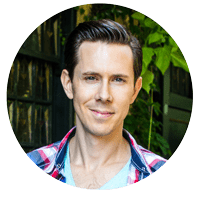 The texture of the chili will be totally different and the cooking times would be different too – probably would need less time. But more importantly, it’s more hearty with the cubed pieces of chuck that fall apart once cooked.